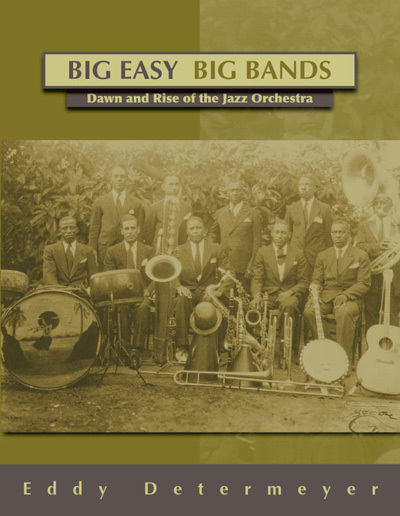 Big Easy Big Bands: Dawn and rise of the jazz orchestra relates the hidden history of New Orleans' jazz orchestras. The story of those legendary big bands that drew thousands of dance-happy citizens to large ballrooms such as the Rhythm Club and the San Jacinto Hall. The older and smaller jazz bands that around 1900 had revolutionized popular music with their collective improvisations, disappeared during the 1920s, or went underground, only to hesitatingly resurface around 1950, during the so-called Revival. Jazz journalist Eddy Determeyer dives deep into the history of the Big Bands in New Orleans. Basing himself on newspaper clippings and interviews with some of the old-timers, Eddy Determeyer restored this forgotten history. He draws attention to the fact that New Orleans around 1940 could be viewed as a national hub for swing dancing, with about ten regular orchestras that were in constant demand. Also, touring big bands were routinely working in the city's dozens of ballrooms. Those big local jazz bands also provided the nucleus for the postwar vogue for rhythm and blues that brought fame to New Orleans. In 1938, thirteen-years-old Roy Brown, a former gospel singer, was part of Walter 'Fats' Pichon's orchestra. After the war, Brown became one of the first local rhythm and blues stars who gained national fame, scoring with hits such as Good Rockin' Tonight, Hard Luck Blues, and Boogie At Midnight. Roy Brown paved the way for sixties soul singers, including James Brown, Bobby Bland and Jackie Wilson. Trumpeter Dave Bartholomew, Brown's senior by five years, was another member of Fats Pichon's orchestra. In 1942, he took over leadership of the band, in the end becoming the city's most outstanding arranger and producer for R&B record dates. Fats Domino was a 1950 find of his; among the other stars he helped shape their careers were Lloyd Price, Shirley and Lee, and Smiley Lewis. The 1930s Louisiana Shakers, led by alto saxophonist Cap'n John Handy, too, may be considered forerunners of the later jump bands. Earl Bostic, who gathered his first musical experience in New Orleans, and who would become one of the 50s most exciting jump saxophonists, based his extrovert style on Handy's. The main reason why these orchestras have remained under the radar was that virtually none recordings were made. After the relatively profuse activities by the recording companies during the 1920s, when bands such as Papa Celestin's, Sam Morgan's, and the New Orleans Owls were thoroughly documented, it would not be before the late 1940s that recording was resumed in the Crescent City. Nevertheless, contemporary musicians and music fans maintained that the level of those local big bands was fully compatible with New York's well-known orchestras. Comparisons were made with Lucky Millinder, Cab Calloway, Chick Webb, and even Duke Ellington. For New Orleans orchestras, their rhythm made the difference. It seems Big Easy's ensembles had a more earthy character – which also pointed the way to postwar rhythm and blues. This story is told in Big Easy big bands. The author has explored virgin territory and in doing so has contributed to our knowledge and insight regarding the development of music in the city that was and still is the focal point of jazz and R&B.